Securing a new multi-use sports venue, hardware products from UNION have been used in the highly acclaimed Loughborough University Stadium. 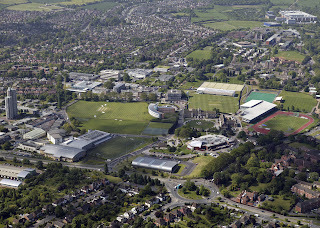 Renowned for its sporting facilities, the University has recently developed a 3500 capacity stadium that has been built to create a permanent home for their football club and to host key fixtures for other sports. A Tottenham Hotspur U18 XI and the legendary Barbarians rugby team played in the first two fixtures to be held at the new stadium. UNION’s Optimus3 lock cases and keyULTRA™ masterkey systems have been used to provide reliable security and effective key management to Loughborough University’s new sporting facility. Specified thanks to its brand heritage and durable properties, keyULTRA™, has been supplied by Robert Pochins of Long Eaton to allow ease of access to users with multiple permission levels, whilst protecting the sports facilities against illegal key copying. “We decided that because the UNION product is synonymous with quality and strength, that it was the ideal solution for our new sporting facility. “We’re very excited to have supplied locking products for such a high profile application and its distinguished reputation in the world of sport, is in part, thanks to its excellent facilities. We therefore recognised the importance of any security specified at Loughborough University. “KeyULTRA™ is made to be strong and durable and has been successfully tested to over half a million cycles, it is a masterkey system that has been certified to the highest standard. UNION’s KeyULTRA™ 6 pin masterkey cylinders possess one of the longest patents on the market, lasting until 2028. This patent protects the key and cylinder assembly, with DuraPIN™ technology. For further information, visit www.uniononline.co.uk.